The MDX NONEMPTY Function is used to display records whose values are not Null. For example, When we are displaying the least Sales by Country wise or Year wise, you may find NULLs as well. It will be annoying to see NULL values in High level data, In order to remove the NULLs we can use this NONEMPTY function with second argument as Sales. Measure: Any Multidimensional member which will return numeric value. 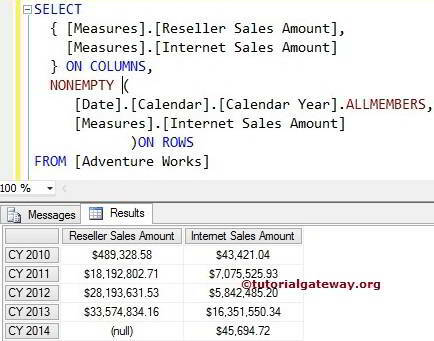 NONEMPTY Function will check against this value to find the Non Empty or Not NULL records. First line of code after the NONEMPTY (first argument) will return all the members present in [Date].[Calendar]. [Calendar Year]. It means, first line of code will bring all the calender years in Date Dimension (2005 to 2014). Next, We assigned the [Internet Sales Amount] as second argument for NonEmpty function. It means, Below line of code will check the Internet Sales Amount of each and every Calender Year returned by the First argument. If the Calender Year has Internet Sales then NonEmpty function will return the corresponding row. 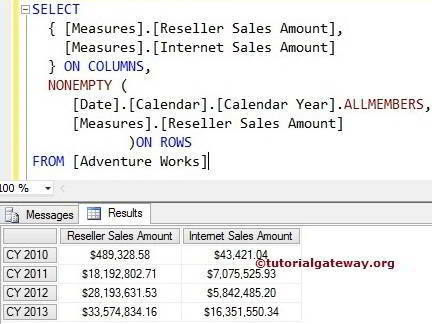 If you observe the below MDX Query, We assigned the [Reseller Sales Amount] as second argument for NonEmpty function. It means, Below line of code will check the Reseller Sales Amount of each and every Calender Year returned by the First argument. 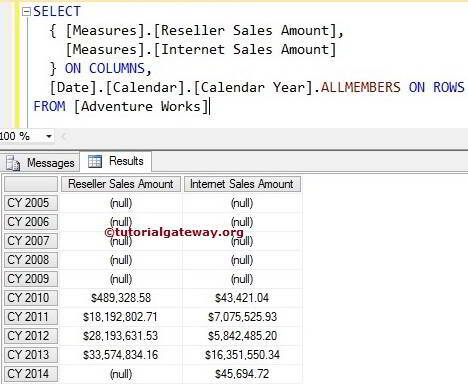 If the Calender Year has Reseller Sales then NonEmpty function will return the corresponding row. NOTE: Please be careful while assigning the second argument to the MDX NonEmpty function. If you place the wrong measure as second argument, you will end up with wrong results.